The Richmond male peregrine falcon is in courtship with a new female. On Sunday morning, April 22nd he was seen sharing a prey item with a new female on the parapet ledge of the Riverfront Plaza building. She is unbanded, has distinctive facial markings with a “heavy hood,” and she is not nearly as buffy as the female previously paired with the male this season. The male was also seen with a second peregrine falcon on the afternoon of Monday, April 16th. 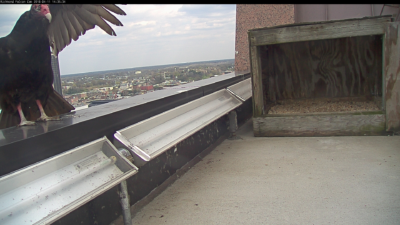 He was seen inside the Riverfront Plaza building nest box while calling to another peregrine falcon that twice flew by the building. This second falcon flying by could have been the same bird that he was seen with on Sunday morning, but it’s difficult to know for sure. Hopefully, this new courtship will lead to a nest at the Riverfront Plaza building. In the meantime, we’ll be keeping a close watch for any reappearances of the new female. 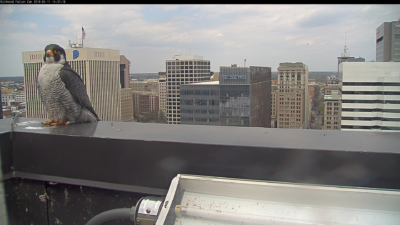 Male peregrine falcon perched on the parapet of the Riverfront Plaza building on April 11th. A surprise visit by a turkey vulture on the afternoon of April, 11th.